The first workload executes on a single IBM z13™ logical partition (LPAR) with 18 central processors (CPs) up to a rate of 174,000 CICS transactions per second. 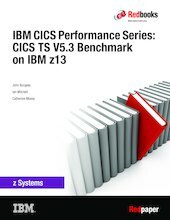 The second workload executes on a single z13 LPAR with 26 CPs up to a rate of 227,000 CICS transactions per second (TPS). In particular, CICS TS V5.3 has optimized transaction dispatching for HTTP requests. In this release, CICS is able to directly dispatch an application transaction for each request that it receives, without first needing to run a CWXN (web attach) transaction.